Award-winning master craftsmen Ray and Pat Oxenford will appear at five more 2016 fine arts and crafts shows in eastern Pennsylvania including the Pennsylvania German Heemet Fescht, the Harleysville Mennonite Museum Applebutter Frolic, the PA Traditional Crafts and Folk Art Sale, the Reading-Berks Guild of Craftsmen Holiday Show, and the Pennsylvania German Christmas on the Farm Festival. The Oxenfords are internationally recognized for carrying on the folk art and other traditions of their Pennsylvania German and Pennsylvania Dutch ancestors. Ray Oxenford is a tinsmith, tinware restorer and woodworker. 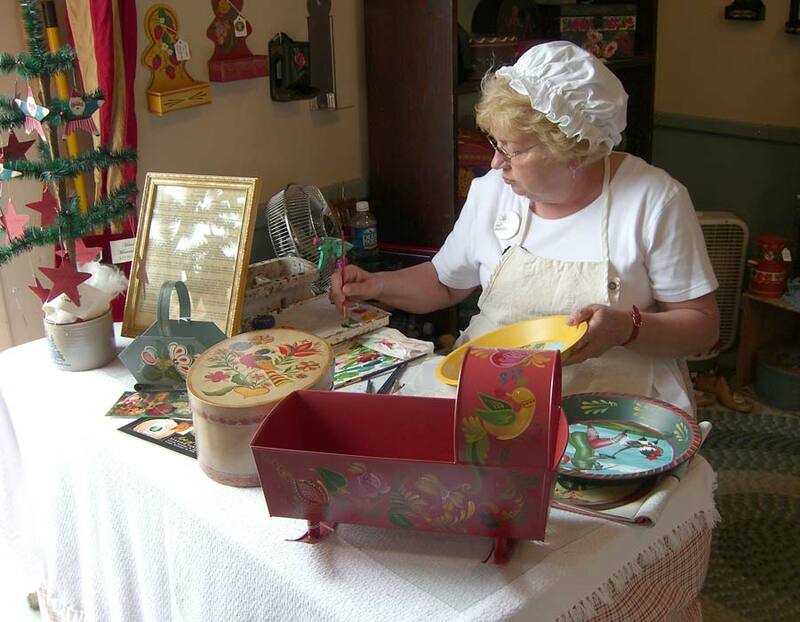 Pat Oxenford specializes in tole painting and creates crafts in the style of famous folk artists such as Peter Ompir and Joseph Lehn. Together they design and create many items including German bride’s boxes, Weber-style chests, traditional tin ware based on 18th and 19th century patterns, coffee and tea pots, document boxes and spice canisters, and also teach and run workshops. Both are heavily involved in arts organizations. The Pennsylvania German Heemet Fescht will be held on Sat., Sept. 24 from 10 a.m. to 4 p.m. at the PA German Cultural Heritage Center at Kutztown University, Kutztown, Pa. The Mennonite Heritage Center, 565 Yoder Rd., Harleysville, will hold its annual Apple Butter Frolic on Sat., Oct. 1, 2016 from 9:30 a.m. to 4 p.m. Held for more than 40 years, the event raises money to support the center mission. The 49th annual PA Traditional Crafts and Folk Art Sale is at the Allegheny Evangelical Lutheran Church at Knauers, Pa., on Sat., Oct., 15 from, 10 a.m. to 3 p.m. It showcases the work of the Oxenfords and several other independent craftspeople displaying and selling hooked rugs, chalk ware, Windsor chairs, fraktur, baskets, fiber, baskets, folk art carvings and Delft Pottery. The Reading-Berks Guild’s 67th annual Juried Holiday Fine Arts and Craft Festival is being held at Kutztown University’s O’Pake Fieldhouse on Sat., Oct. 29 (9 a.m. to 5 p.m.) and Sun., Oct. 30 (10 a.m. to 4 p.m.). The Oxenfords are lifetime members of the Reading and Pennsylvania guilds. The Sat., Dec. 3 Christmas on the Farm event at the Pennsylvania German Cultural Heritage Center, 22 Luckenbill Road, Kutztown, Pa., presents Pennsylvania Dutch folk life demonstrations, a Belsnickel visit, a petting zoo and more. Pat Oxenford announced that she will teach a Pennsylvania German Feather Tree Workshop at the Harleysville Mennonite Museum on Sat., Nov. 5 from 9 a.m. to 3 p.m. Email the center info@mhep.org for fee and other details. For more details and information about the Oxenfords, including a gallery of their work, visit their website or email them at inquiries@paoxenford.com. Douglassville, PA—Award-winning artists Ray and Pat Oxenford, Douglassville, (www.paoxenford.com), lifetime members of the Reading-Berks and Pennsylvania Guilds of Craftsmen, will be part of the “Pennsylvania Hands” (www.amhands.com) exhibit scheduled to show in six cities throughout the state through the end of July. Pat Oxenford, known for her Early American tole and decorative paintings, and her husband, Ray Oxenford, an accomplished tinsmith, will also appear at several other major art, crafts and folk art shows in southeastern Pennsylvania throughout 2011. Reading, PA—The Reading-Berks Chapter of the Pennsylvania Guild of Craftsmen in partnership with Kutztown University and the PA German Heritage Center, will hold its 60th Annual Juried Holiday Craft Show on Sat., Oct. 31 (9 a.m.-5 p.m.) and Sun., Nov. 1 (10 a.m.-4 p.m.) at Kutztown, PA.
One of the region’s most popular seasonal shopping events for authentic local art and crafts—will be held this year in a new location—Keystone Hall on the campus of Kutztown University at South Campus Drive and Baldy Street, just off Route 222. Douglassville, PA—Behind every craft is a story about the artisan. Pat Oxenford’s decorative and tole paintings illustrate a saga of how 18th-century Pennsylvania German history relates so closely to her life. 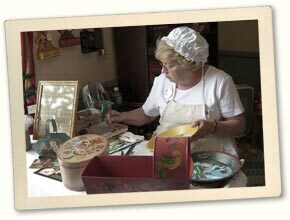 Pat has been doing decorative painting for more than three decades and has written a guide book, Heritage Crafts Today, Tole Painting, that teaches the technique of tole painting as well as the history behind the craft. She is a juried member of the Pennsylvania Guild of Craftsmen, a member of the National Society of Decorative Painters and a Brazer Guild member of the Historical Society of Early American Decoration. “My father was German,” said Pat. “He never got to pursue art, but he did some artwork for his Lehighton High School yearbook.” Lehighton, Pa. is populated by many citizens with a Pennsylvania Dutch heritage. Oxenford recalled a childhood memory of her father sitting down with her and carving a sailboat out of ivory soap. Douglassville, PA—Award-winning Guild Artist Pat Oxenford (www.paoxenford.com), Douglassville, who is renowned for her Early American tole and decorative paintings, and Ray Oxenford, an accomplished traditional tinsmith, will appear at the Kutztown Folk Festival from June 27 through July 5, 2009—their 14th straight appearance. Pat Oxenford, one of the most in-demand artists and a frequent toleware and tole painting seminar presenter at the festival, designs and decorates all types of tinware including trays, document boxes, coffee and teapots, spice canisters and more using authentic 18th, 19th and 20th century designs. She enjoys recreating the designs of Peter Ompir, Peter Hunt and other early folk artists.